NaNoWriMo was promoted in the “Find the Clues to the Novel Only You Can Write” panel. 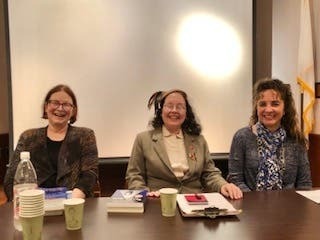 The Waltham Public Library and Sisters In Crime New England joined up to showcase a trio of talented gumshoes: Sheila Connolly, Sharon Healy-Yang, and Gina Fava. Sheila Connolly is a New York Times bestselling author living in Massachusetts. She has four series: “The Glassblowing Series;” “The Orchard Series,” set in Massachusetts; “The Museum Series”, and “The County Cork Series” which she researched on trips to Ireland. She incorporated local folklore and flavor to stir the pot of her cooked up stories. Sharon Healy-Yang is quite the dame. She is an independent author finalist in the National Indie Excellence awards. When she is not writing, she teaches in the Worcester State University’s English Department. Her mystery novels include “Bait and Switch” and “Letter from A Dead Man.” Film noir and old-fashioned 1940s suspense movies enthrall and inspire her. This is evident in the styling of her sharp-witted lead females and snappy dressers in her mysteries. When asked how they combated writer’s block, all three mystery women definitively declared that it did not exist for them. They each suffered instead from the pang of dreaming up TOO MANY ideas to write about.